Recently, breakthrough technological advances have made it possible, for the first time, to isolate and characterize extraordinarily rare circulating tumor cells (CTCs) from the blood of patients with cancer. Using both patient samples and mouse models, coupled with microfluidics technology and single cell resolution RNA sequencing, we found that CTC-clusters, held together by strong cell-cell junctions, represent metastatic precursors in the circulation of patients with cancer. Furthermore, we developed a new microfluidics technology capable of isolating CTC-clusters from the unprocessed blood of patients with cancer. All together, these studies highlight CTC-clusters and cell-cell junctions as a previously unappreciated and potentially targetable mechanism of cancer dissemination. Cancer metastasis accounts for the vast majority of cancer-related deaths, and, currently, no treatments are available to suppress a metastatic disease. Understanding the complex, yet fundamental mechanisms underlying the development of cancer metastasis in patients is critical for developing successful therapies. While most of our understanding of how metastasis occurs is derived from mouse models, the analysis of human metastatic precursors in the circulation of patients with cancer has been greatly limited by technological constraints. Recently, breakthrough technological advances have made it possible to isolate and interrogate for the first time rare circulating tumor cells (CTCs) from the blood of patients with metastatic cancers, revealing unexpected features of the metastatic process. 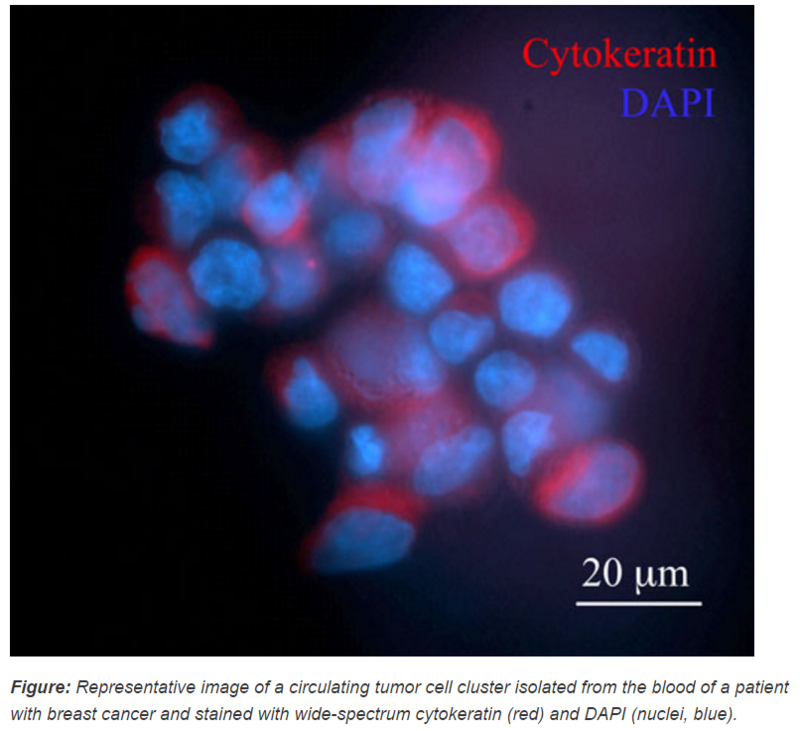 Figure: Representative image of a circulating tumor cell cluster isolated from the blood of a patient with breast cancer and stained with wide-spectrum cytokeratin (red) and DAPI (nuclei, blue). 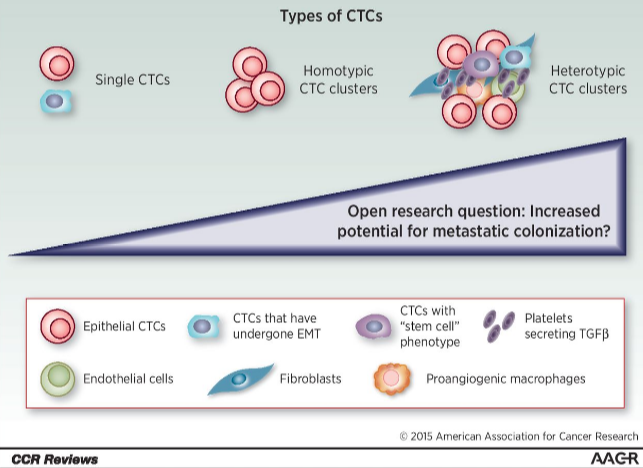 We found that, while the majority of CTCs in patients are found as single cells, rare clusters of CTCs (CTC-clusters) (see figure) can break off the primary tumor and metastasize up to 50 times more efficiently than single CTCs . CTC-clusters are held together by the expression of cell-cell junction components such as plakoglobin. Expression of plakoglobin in the primary tumor of breast cancer patients results in a reduced progression-free survival. Furthermore, targeting plakoglobin in mouse models suppresses the formation of CTC-clusters and metastasis. Based on the findings that revealed the high metastatic propensity of CTC-clusters and their dependence upon cell-cell junctions, we developed a new microfluidics technology (the Cluster-Chip) to enable the isolation and characterization of CTC-clusters from unprocessed human blood samples . The Cluster-Chip isolates CTC-clusters through specialized bifurcating traps under low shear stress conditions. With this technology, we isolated CTC-clusters from patients with cancers of the breast, prostate and melanoma, and further characterized immune system components associated with CTC-clusters. All together, these results suggest cell-cell junctions and CTC-clustering as a fundamental mechanism of cancer dissemination, and warrant further studies to enable the development of metastasis-tailored therapies for patients with cancer.